Each year, the Academy of Adventure Gaming Arts and Design (AAGAD) presents the Origins Awards recognizing the gaming industry's top achievements and products released during the previous year. 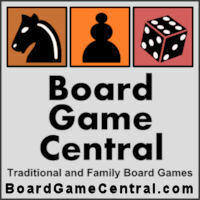 Board Game Central is pleased to offer a new online Mahjong game, Mahjong Time. Mahjong Time is an online version of the traditional Chinese game of Mahjong. This is not the solitaire type of mahjong. Antarctica Global WARming is a futuristic game of global survival that features an innovative rotating weather map, which allows storms to move around the game board affecting game pieces with a roll of a dice.